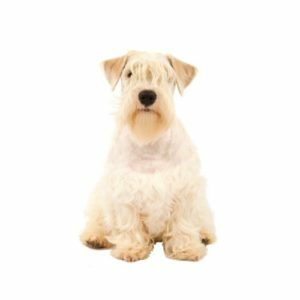 Although small, the Sealyham Terrier is the embodiment of power and determination a true terrier! The Sealyham’s wiry, weather-resistant double coat should be all white. Lemon, tan or badger-colored markings are allowed on the head and ears. Very keen and alert, the breed was used as a hunter in the past, although today they excel as a family pet and participant in Earthdog competitions. This proud, compact, sturdy little dog makes an ideal companion. Charming and inquisitive, he loves his family, but as a spirited terrier breed, needs something to keep his active mind occupied. The breed may enjoy hunting on the farm, but can thrive anywhere if they are allowed to enjoy a brisk daily walk. Brushing and combing is necessary at least twice a week to remove mats and trimming is necessary every month. Are you interested in purchasing a Sealyham Terrier?